(if you cannot manage a thinner back), make a rabbet in it, so that one-half of the back is outside the stud ??? I already have 2" polyiso so budget dictates it gets used. 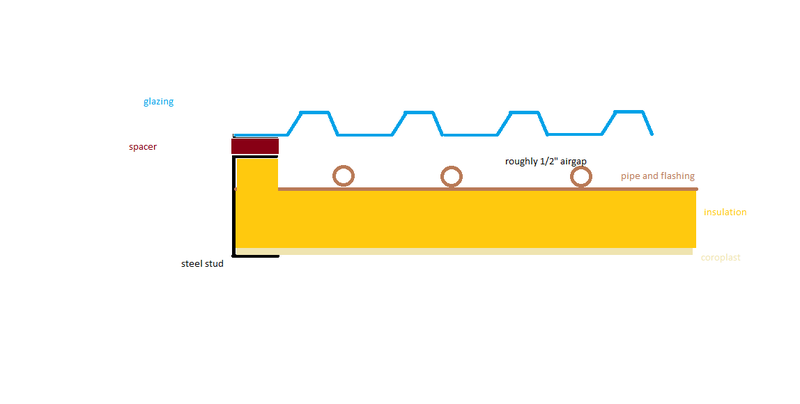 I could cut a rabbit or something to make the stud slide inside the insulation but that would leave the coroplast outside of the stud and I'm hoping to use the coroplast and stud to add strength to the collector. If I was doing this again I'd definitely do 2 8'x4' vs 1 16'x4' even thought he headers are way more expensive due to the reducing T's. That would remove the need for the extra strength as there would be no joints in the foam. here's an option I just thought of. Just add a spacer on top of the stud to move glazing up if need be. It can't be foam as it needs to hold up to the sun but painted wood would be ok there. a strip of 3/4" plywood or something like that I'm sure I have kicking around. Great news about the test location ! Also brilliant idea, that glazing spacer ! (Even rubber hose might do the trick). coroplast and steel stud fairy showed up at my house today so the project continues. I was a little dubious about the use of the stud track as it doesn't look the best in the pictures online. It looked decent in person. I slipped it onto the foam box and it looks quite good and will look excellent when painted up. It also completely removed the movement from the joints in the foam box. I'm very very happy with how that went together. I'll finish the foam and post pictures tomorrow hopefully. I'd be very surprised if the entire thing weight 40 lbs. I can easily lift it weight wise but it's awkward enough that I want a second person to assist in me getting it off of the sawhorses so that I can sit the pipe grid on it and drill the necessary holes and run the wires in the back of it before putting the coroplast on it. It's very rigid and shows no signs of flex when I lift it by one end. I'm VERY happy with how it's turned out. I'll use some construction glue to hold the insulation in for the places that it's a bit loose and I'll add a fair number more screws. This was just enough to keep things rigid and let me move it around while I work on it. I'll likely have to unscrew it to get the coroplast in but that can wait. Construction of what exists here is really simple. 2" polyiso on the back. I ripped one sheet in half so it's 4', 8' 4' to stagger the joints. I used 5 pieces of 3/8" dowel about 5" long in each joint to physically lock each piece together. Just drilled a hole in the middle of the sheet added a drop of glue on each side, inserted the wood then pushed the pieces back together. It seemed to help. I then wrapped the entire thing with the steel studs, the extra foam in the side required to fill the stud was cut from a chunk of 3" I have kicking around. 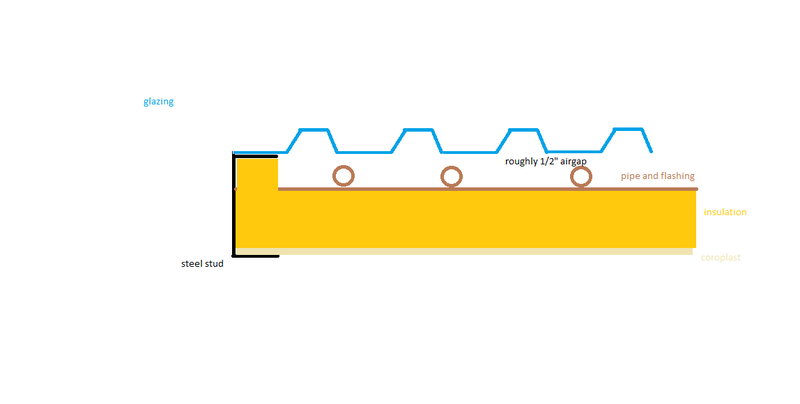 Each joint in the steel stud is overlapped by 8-10" and has 3 screws holding it all together. It all went together easy enough by myself. I'm curious on what everyone recommends for the tilt angle. I'm at roughly 49 degrees north. the collector is 64 sqft. My goal is 100% of my water heating so long as it's not overly cloudy. That should be trivial to do but a few weeks of cloud followed by a few hours of sun then more cloud is pretty normal in the winter (Pacific northwest) so I'm not expecting to actually get 100% water heating in the winter as I won't have a massive storage tank to carry through that long. So I'm trying to buck the tilt angle. I've seen latitude + 15 recommended a few times. That would favour winter gains while hurting summer. I'm assuming that my collector is large enough that I won't have any real concerns with summer gains? is 64 (65 because my cutting won't be that accurate) a perfectly reasonable goal to aim for? Looks like you have a choice between 60°C and 90°, or somewhere in between ! I wonder if it really matters ? It is going to be a trade-off in any case (you will only have the exact good angle on two days of the year anyhow...). 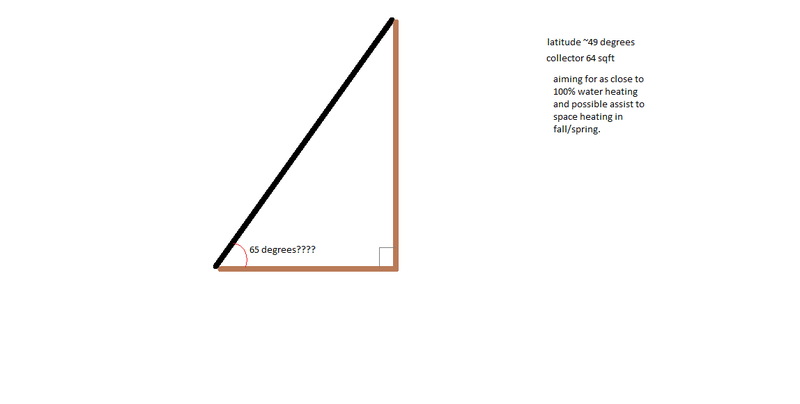 My angle is going to be 90° vertical, period - I don't have any choice in the matter ! As for my summer HW requirement, it is very small - so small, in fact, that building a collector for DHW would scarcely make economic sense. However, my collector is for winter-time heating -- and as much as I can grab ! I would MUCH prefer to have to dump "free solar" hot water to drain, rather than PAY the electric company a single CENT for heating my house . OK, I pay them a bit for heating my HW, you rarely get a free ride all the way ! I'm not expecting to actually get 100% water heating in the winter as I won't have a massive storage tank to carry through that long. Multidrum storage is a good way to go, for both modularity and cost reasons ("you can always add a few more barrels in the future...").